Same problem here for me on a brand new Cintiq 27QHD running on Mac OS Sierra. I had the latest drivers installed which fixed the Express Key Remote...mostly, but the jagged lines are crazy stupid. I have rolled back to 18-4 and lines are smooth. I have a Windows laptop for work and there are no problems with that driver. So glad I spent $$$$$$$ on this Premium (cough) experience. Are people still dealing with this? Wacom Support told me to load older drivers on my Cintiq 24HD (6.3.17-5). I earn my living on this computer/tablet and the last two months have been a nightmare. Yes, this still exists. Wacom has finally recognized the problem and said they are working with Apple, but it's still terrible. It's frustrating because Sierra has been available as a beta for many many months, I wish Wacom would have recognized and worked toward resolving this issue a long time ago. Hopefully Wacom can keep up with future Apple updates more quickly in the future, instead of things breaking and taking months to fix while their customers suffer the frustration. This was all preventable and could be seen as soon as the Sierra betas were released. Here's my latest driver report. Was using 6.3.18-4 with no problems on Sierra 10.12.1 But when I upgraded to 10.12.2. expresskeys were broken. Driver 20.8 was working okay so I upgraded to 10.12.3 But after a while I felt like the inking lines weren't as smooth as 18-4. (I work with Clip Studio, not Photoshop). I upgraded to the 20-11 driver and the lines were great, and the remote seemed to work at first--at least using a modifier key on the remote didn't crash the driver. But I soon realized that keys programmed to a quick key tool switch (like G for paint bucket ) weren't reverting back to the previous tool when released. And space wasn't working to get the hand tool. The keys were just acting like a quick press, not a press and hold (even though the were registering as press and hold in diagnostics). I didn't want to have to revert back to 10.12.1, so I ditched the remote and plugged in an older X-Keys 24 that I used to use, programmed with Controllermate mapping the keys. To my surprise, quick keys didn't work on that either. So my conclusion is that something in Sierra breaks the functionality of mapped keys as far as press and hold goes and the issue may not be so much a Wacom problem, as a Mac one. Since I couldn't get any programmed key set to work properly for my shortcuts, I had to revert back to 10.12.1. Back on that now, and tried the 20.11 driver and it works great. All keys work right and the line quality is super smooth. So whatever happened in the OS after 10.12.1 is the problem. I can't vouch for the quality in photoshop (CS5)--I just tried it and the lines seem smooth at 100% but jittery when drawing zoomed out. I also work in Clip Studio -which I entirely blame on this stupid line jitter issue. Since I can dial in a little line stabilization on a pen-by-pen basis it has become the only program I can actually get any work done in. Even with the old drivers (see last my post) which Wacom tells me are stable I can't work in Sketchbook Pro, which I prefer over CSP. The one bright spot of this whole experience is that I'm finally reaching a level of proficiency with CSP that I would never have reached just messing around with it in my free time. Hahaha . . ugh. 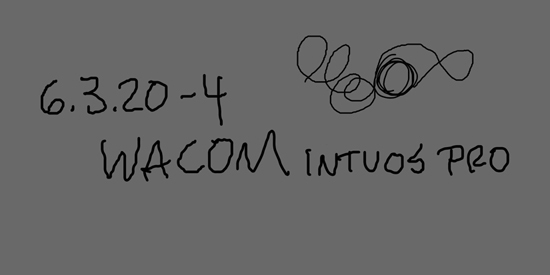 Any more news on this Wacom??? This is been more than two months now with no fix. This is getting to a point now where it's seriously affecting the quality of the work our studio is producing. I want to throw my Cintiq out the window. This is terrible!